I am looking for a Research Assistant to work in 360 Degree Video project at Charles Sturt University, Bathurst. The potential candidate should have PhD degree (or submitted thesis) in Computer Science or related discipline from good university with excellent track record in video processing, coding, machine learning, and/or computer vision areas. To express your interest, you must send your latest CV with a brief research proposal to Associate Professor Manoranjan Paul at email: mpaul@csu.edu.au. Manoranjan Paul received PhD degree in computing from Monash University, Australia in 2005. He was an Assistant Professor in Ahsanullah University of Science and Technology. He was a Post-Doctoral Research Fellow in UNSW, Monash University, and Nanyang Technological University from 2005 to 2011. He has published 150+ refereed publications. His publications are cited 1763 times with h-index 23, i10 index 50, m-index 1.3 according to Google Scholar. A/Prof. Paul published 15 journal articles in IEEE Transactions on Image Processing (Rank A*), Circuits and Systems for Video Technology (Rank 1 in Multimedia), Multimedia (Rank 2 in Multimedia), Broadcasting (Rank 3 in Media Technology), Neural Systems and Rehabilitation Engineering (Rank A*), and Biomedical Engineering (Rank A*). He was a keynote speaker in IEEE DICTA 2017, IEEE WoWMoM Workshop 2014, IEEE DICTA 2013 and IEEE ICCIT 2010. A/Prof. Paul is an Associate Editor of IEEE TCSVT, IEEE TMM and Eurasip Journal in Advances on Signal Processing. He is a Senior member of the IEEE and ACS. He served as a General Co-Chair of PSIVT 2019, Program Co-Chair DICTA 2018 & PSIVT 2017, and Publicity Co-Chair DICTA 2016. A/Prof. Paul obtained a number of competitive grants including two ARC Discovery Projects and Cybersecurity CRC. I am looking for PhD and Masters students in Cybersecurity, Video coding, hyperspectral imaging, EEG Signal Processing, Image Processing, Computer Vision, and Medical Signal Processing. The potential candidate should have Master degree or 4 years honours/bachelor degree in Computer Science or related discipline from good university with good results. Good English and programming skill are also desiarable.To get scholarship, a candidate with previous experience in research and a number of publications gets priority. Video Technology (coding, compression, and processing). Hypespectral Imaging (coding and processing). E-Health (Tele-Health, Fall Detection, Virtual Reality, Augmented Reality). Computer Vision (Background modelling, Video summarization, Object detection). Human-Computer Interaction (Eye Tracking, EEG). Human Cognition (Engagement and attention modelling). ICT Researcher of the Year 2017 by Australian Computer Society. Travel Award , Australian Academy of Science, 2016. Research Excellence Award, School of computing and Mathematics, Charles Sturt University, 2016. Research Supervision Excellence Award, Faculty of Business, Justice and Behavioural Sciences, Charles Sturt University, 2015. Research Excellence Award, Faculty of Business, Justice and Behavioural Sciences, Charles Sturt University, 2013. Research Excellence Award, School of Computing and Mathematics, Charles Sturt University, 2011. Early Career Researcher of the Year, Faculty of Information Technology, Monash University, 2008. Australian Research Council (ARC) Discovery Grant, 2019-2021, "DP190102574: Efficient multi-view video coding with cuboids and base anchored models," $380,000. Australian Research Council (ARC) Discovery Grant, 2013-2015, "DP130103670: Multiview Video Coding using Cuboid Data Compression," $315,000. Australian Government's Cybersecurity CRC Project Grant, 2018-24. CSU-Royal Far West Industry Partnership Project Grant, 2018-2022. Charles Sturt University Research Fellowship, 2018-2020, "Video Analytics," $146,000. Charles Sturt University Research Infrastructure Block Grants (RIBG), 2015, "Food quality assessment using Hyperspectral Camera," $63,110. Faculty of Business Compact fund, 2015, "Epileptic Seizure prediction," $17,000. Faculty of Business Compact funding for PhD project grant, 2013-2016, "Multiview video coding," $154,000. Charles Sturt University Educational Equipment Grant, 2014,"High Performance Computing in Multiview Video coding," $20,000. Charles Sturt University Research Infrastructure Block Grants (RIBG), 2013, "Image depth estimation, visualization, and quality assessment using intelligent computing," $50,000. Charles Sturt University Research Infrastructure Block Grants (RIBG), 2012, "Abnormal event detection using eye tracker technology," $50,000. Faculty of Business Compact Fund, 2013, "Imaging Under Dangerous Conditions, specifically within the Mining Industry," $85,000. Australia-China Science Research Fund (ACSRF), 2012, "WAREIGS: Wavelet-Network-Based Augmented-Reality-Enhanced Image-Guided Surgery," $38,000 . Faculty of Business Compact fund, 2012, "Efficient Algorithms for Nuclear Norm Minimization," $12,702. Faculty of Business Compact Fund, 2012, "Eye controlled video coding," $12,829. Faculty of Business Compact Fund, 2011, "Visiting Fellow," $14,036. Nanyang Technological University URECA grant, 2009-2010, "Undergraduate Research Experience on Campus (URECA) project(2009-2010)," $21,600. ARC (Australian Research Council) Research Network in Enterprise Information Infrastructure (EII), 2007, "Video Signal Processing and Communication Taskforce Grant," $25,000. December 2018: Congratulations to A/Prof. Manoranjan Paul for the successful obtaing an ARC Discovery Grant 2019-2021. June 2018: Congratulations to A/Prof. Manoranjan Paul for the CSU Research Fellowship 2018-2020. November 2017: Congratulations to A/Prof. Manoranjan Paul for the ICT Researcher of the Year, ACS Digital Disruptor Award, 2017. November 2017: Congratulations to Dr Pallab Podder for his successful PhD degree. September 2015: Professor Sanjoy Paul, QIMR Berghofer Medical Research Institute, Australia. August 2015: A/Professor Wei Xiang, USQ, Australia. July 2015: Professor Raj Gurutajan, USQ, Australia. June 2015: Professor Vinod Chandran, QUT, Australia. DM. M. Rahaman and M. Paul (2017), "Virtual View Synthesis for Free Viewpoint Video and Multiview Video Compression using Gaussian Mixture Modelling," IEEE Transactions on Image Processing, 2017, JCR Impact Factor 4.83, Rank 1 in Signal Processing (Google Metric), CORE Rank A* . M.Z. Parvez and M. Paul (2017), "Seizure Prediction using Undulated Global and Local Features," IEEE TRansactions on Biomedical Engineering (JCR Impact Factor 3.6), 2016. CORE Rank A* . M. Paul (2017), "Efficient Multiview Video Coding using 3D Coding and Saliency-based Bit Allocation," ,� IEEE Transactions on Broadcasting (JCR Impact Factor 3.77, CORE Rank A .
M. Z. Parvez and M. Paul (2016), "Epileptic Seizure Prediction by Exploiting Spatiotemporal Relationship of EEG Signals using Phase Correlation," IEEE Transactions on Neural Systems and Rehabilitation Engineering, 2016 (JCR Impact Factor 3.41, CORE Rank A* . M. Paul, W. Lin, C. T. Lau, and B. �S. Lee (2014), "A Long Term Reference Frame for Hierarchical B-Picture based Video Coding," IEEE Transactions on Circuits and Systems for Video Technology (JCR Impact Factor 3.6), 2014. Rank 1 in Multimedia . M. Paul, W. Lin, C. T. Lau, and B. �S. Lee (2011), "Direct Inter-Mode Selection for H.264 Video Coding using Phase Correlation," IEEE Transactions on Image Processing (JCR 5 years Impact Factor 4.83), Vol. 20, no. 2, 2011. Rank 1 in Signal Processing (Google Metric) and CORE Rank A*. A. Liu, W. Lin, M. Paul, and F. Zhang (2011), "Optimal Compression Plane Determination for Video Coding," IEEE Transactions on Image Processing (JCR Impact Factor 4.83, SNIP 4.22), vol. 20, no. 10, pp. 2788-2799, 2011. Rank 1 in Signal Processing (Google Metric) and CORE Rank A*. M. Paul, W. Lin, C. T. Lau, and B. �S. Lee (2011), "Explore and model better I-frame for video coding," IEEE Transactions on Circuits and Systems for Video Technology,(JCR Impact Factor 3.6), 2014. Rank 1 in Multimedia (Google Metric). M. Paul and M. Murshed (2010), "Video Coding focusing on block partitioning and occlusions," IEEE Transactions on Image Processing (JCR Impact Factor 4.83), vol. 19, no. 3, pp. 691-701, March, 2010. Rank 1 in Signal Processing (Google Metric) and CORE Rank A*. A. Liu, W. Lin, M. Paul, and F. Zhang (2010), "Just Noticeable Difference for Image Pixels with Decomposition Model," IEEE Transactions on Circuits and Systems for Video Technology, (JCR Impact Factor 3.6), 2014. Rank 1 in Multimedia (Google Metric). Professor Manzur Murshed (Co-Investigator of an ARC DP project- DP130103670), Federation University. Professor Weisi Lin (Co-Investigator), Nanyang Technological University, singapore. Professor Junbin Gao (Co-Investigator), University of Sydney. A/Prof Chandana Withana, Charles Sturt University. Dr Abeer Alsadoon, Charles Sturt University. Dr Subrata Chakraborty (Co-Investigator), Southern Queensland University. Dr Mortuza Ali (Research Fellow in Multiview video coding funded by ARC DP Project-DP130103670), Federation University. Dr Tanmoy Debnath (Research Associate in Multiview video coding funded by ARC DP Project-DP130103670), Charles Sturt University. Dr Mohammad Zavid Parvez (former PhD student), ISI Foundation, Italy. Dr Niras C.V. (formr PhD Student in Hardware Design in Motion Estimation), Macquarie University. Dr Shampa Shahriyar (former PhD Student), Data Scientist, ANZ Bank. Dr MD Salehin (former PhD Student in Video summarization), Evon Dixon. Dr Bin Liang (former PhD Student in Human Gait Recognition project), CSIRO. 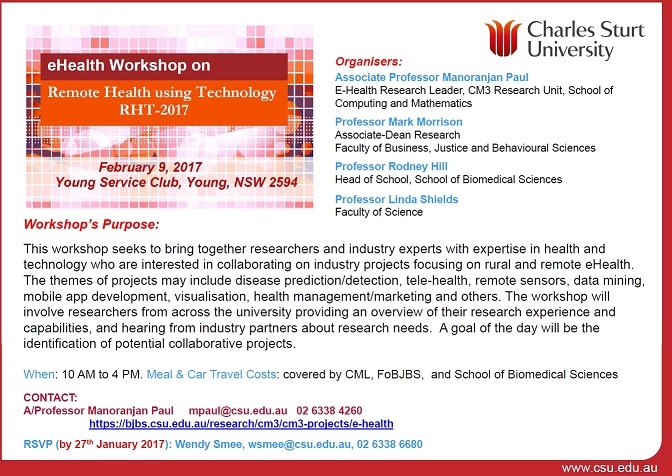 Dr Pallab Podder (former PhD Student in Video Coding and Eye tracking Technology funded by ARC DP Project), Charles Sturt University. Rui Xiao (PhD Student in Hyperspectral imaging funded by Charles Sturt University), Charles Sturt University. DM Motiur Rahman (PhD Student in View Synthesis for Free Viewpoint Video and TV), Charles Sturt University. Toufique Soomro. (PhD Student in Eye Related Disease and Brain Abnormalities), Charles Sturt University. Linh Pham (Doctor of Information Technology Student in cardiopulmonary measurement), Charles Sturt University. Pushkar Bhatkoti (Doctor of Information Technology Student in Diagnosis of Alzheimer�s Disease), Charles Sturt University. Cameron White (Honours in Cybersecurity), Charles Sturt University. Rafiqul Islam (PhD student Video Analytics), Charles Sturt University. Australian Workshop on Video/Image Coding, Processing, and Understanding (VICPU) 2015 is about application of ideas on Video and Image Processing to help regional industries improve their productivity; to restructure so as to be more effective in a changing economic climate. This workshop is targeting researchers, engineers, consultants and technical managers interested in this rapidly changing field. It targets those effective ideas with clear application.